Passively cooled computing systems carry many advantages. Most of these turn out to be very important for industrial and embedded applications. In recent years, both AMD and Intel have been paying extra attention to the peformance per watt aspect of their computing platforms. This has led to ultra-compact form factor (UCFF) PCs emerging as ideal candidates for passive industrial computing platforms. We have already reviewed a number of industrial PCs before. Today, we will be taking a look at the Compulab fitlet-XA10-LAN, a unique passively-cooled UCFF PC that doesn't sacrifice on I/O capabilities. Compulab is one of the major players in the passively-cooled embedded and industrial PC market space. They have different product lines catering to different requirements. One of the first Intense PC models was reviewed by us back in 2013. Since then, Compulab has introduced the uSVR micro-server for high-end applications and a range of more affordable small-footprint PCs such as the IPC2, fit-PC3 & fit-PC3i, fit-PC4 and the fitlet. 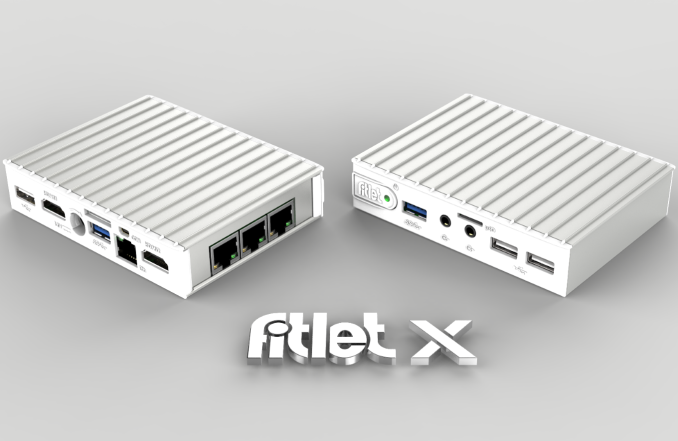 The fitlet-XA10-LAN, powered by an AMD Mullins SoC, obviously belongs to the last category. The dimensions of the PC come in at 10.8cm x 8.3cm x 2.4cm, making it smaller than the NUCs. Compulab has been making improvements to the chassis even after the introduction of the product into the market. The original thermal design allowed for the internal SoCs to operate at their rated TDPs. However, Compulab also started to offer a finned top panel last year. It is a slot-in replacement for the existing top panel and allows the TDP limitations to be safely bypassed. Starting this quarter, they will be replacing the original top panel with something similarly sized, but having a different coating based on the knowledge gained during the development of the Compulab Airtop. For the prupose of this review, Compulab sent us two units of the fitlet-XA10-LAN (one with the original chassis and another with the newly improved top panel). In addition, the fit-Uptime (a UPS for the fitlet series and NUCs with a 18 Whr battery) was also bundled with the review kit. The fitlet-XA10-LAN comes with a host of additional items to improve I/O capabilities (including a HDMI to DVI adapter and an external USB 2.0 WLAN adapter). A 36W (12V @ 3A) AC adapter is also bundled with the unit. We will cover the hardware aspects in detail in a later section. The most striking aspect of the fitlet-XA10-LAN is the presence of four gigabit LAN ports. Most fanless UCFF PCs sacrifice I/O capabilities in order to achieve good thermal performance in a compact size. Compulab's innovative FACE modules bring a unique solution to this interesting problem. They allow a compatible PC to sport different 'add-on cards' that provide I/O suitable for the desired application. These FACE (Function And Connectivity Extension) modules have well-documented specifications, enabling third-party designs also. FACE modules, however, are too big for the fitlet series. In its place, Compulab has developed FACET (Function And Connectivity Extension T-Cards) to provide extended peripheral and I/O connectivity for the dimunitive fitlet PCs. FACET cards interface with the main SoC / CPU using three PCIe 2.0 lanes. They also support routing of USB 2.0, SMBus and LPC signals while using the industry-standard mini-PCIe interface. The fitlet-XA10-LAN comes with a FACET LAN card that has three Intel I211 GbE controllers, each of which connect to one PCIe 2.0 lane on the FACET interface. The specifications of our CompuLab fitlet-XA10-LAN review configuration are summarized in the table below. The CompuLab fitlet-XA10-LAN review kit came with Linux Mint pre-installed on both units. However, our evaluation workflow involves Windows. We prepared a Windows 10 Pro x64 installation 'to go' on a Corsair Voyager GTX 256GB USB 3.0 flash drive. We also instrumented it with all our standard benchmarks. On the main mSATA drive with the Linux Mint installation, we created a NTFS partition. This partition was used as the target drive for our storage benchmarking. The system operated flawlessly with our Windows To Go installation once the appropriate drivers were installed. In the rest of the review, we first take a look at the internal hardware organization, as well as the platform and the BIOS features. This is followed by a look at the various performance benchmarks under Windows. Usually, we talk about the HTPC capabilities of various PCs that we review, but, it is obvious that the target market for the fitlet-XA10-LAN is quite different. Instead of the HTPC aspects, we will discuss some networking performance benchmarks. After that, we move on to the thermal design and its efficiency. In particular, we will compare the thermal performance of the two different configurations. In the final section, we look at some miscellaneous aspects and provide some concluding remarks. The table below has an overview of the various systems that we are comparing the CompuLab fitlet-XA10-LAN against. Note that they may not belong to the same market segment. The relevant configuration details of the machines are provided so that readers have an understanding of why some benchmark numbers are skewed for or against the CompuLab fitlet-XA10-LAN when we come to those sections. The ancient Zbox Nano AQ01 with an A4-5000 runs my 1080 display flawlessly - never a decoding single while streaming, including every H265 file I've tried. Performance-wise it could be used as an HTPC. That said, you'd be better off considering a different variation of the fitlet unless you have a pressing need for all the networking ports. Caveats: The fitlets I had got VERY hot. I found the same results over multiple units and more than one variation of the fitlet, so I don't believe it to be a one off issue. I put them on top of mesh shelving and ran a fan on them as they would discolor the surface of the shelve they sat on over time. They had shallow fins on the top, so I believe they were second revision. The new heatsink may fix this problem.